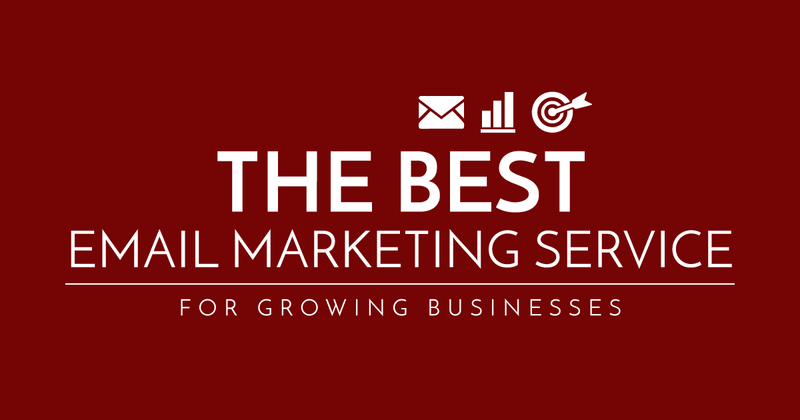 What’s the best email marketing software for a growing business? Ah, yes. The million-dollar question, right? Well, okay. Maybe not one million dollars on the nose. But still a pretty crucial question for any business owner looking to grow their subscriber base and reach more potential customers. In fact, the question isn’t crucial only for growing businesses, but for all companies out there, regardless of their size or years in business. And it’s a question we get asked all the time. First, if you’ve been scratching your head over this question, wondering how you can take your email marketing to the next level, no need to feel bad. You’re not alone! And second, if this question has been giving you a heartburn every time it pops into your head, no need to panic! Today, we’ll help you understand how to navigate the email marketing software landscape so you can select the best service for your business. We’ll explain how to read and understand the features different services offer. We’ll take a close look at three of the email marketing softwares that most often come up in our discussions with business owners looking to take their company to the next level. And we’ll recommend the email marketing software we consider best for business owners with high aspirations. What Am I Supposed to Look for in an Email Marketing Software?!? All those features and plans and services… Did I need all of them? Did I need any of them? What did they do, anyway? And there weren’t even that many email marketing software to choose from back in those days. Nor nearly as many features and capabilities to compare as there are today. So if you’re feeling the anxiety right now, I totally get you. Good news is, after working with multiple email marketing services over the years, both for our purposes and the purposes of our clients, we’ve managed to decode the email marketing software. And we want to help you understand the options available out there and choose the software that best fits your business needs and goals. But, before we dive deep into particular features, let’s first break down the key aspects of an email marketing program and look at the general capabilities you should be looking for. Can Your Email Marketing Software Do This? Getting subscribers on your list is great. And necessary! But after a while, you’ll find that you don’t want all subscribers thrown into a bucket without a way of moving them around. Once your business starts growing, you’ll want to create more sophisticated email marketing campaigns. For example, you may want to send a reminder email about an offer only to subscribers who’ve opened your email but haven’t taken action. And you may also want to send a different email to those who haven’t opened your first offer email at all as a second attempt to entice them. Without segmentation capabilities, you’ll end up sending irrelevant emails to subscribers that can confuse them, or worse, make them unsubscribe. When looking at email marketing software, you want to make sure that the one you choose allows you to segment and move your subscribers around into different groups. Dynamic groups, if possible. The whole point of having an email marketing software is that you don’t have to send emails manually to subscribers. Especially because not all emails you send will be general blasts to your entire list. Email marketing automation allows your to create campaign workflows that function on their own. Got a new subscriber today? Automate a process to have a welcome email get triggered out to them, followed by a best-posts email a few days later that your long-term subscribers don’t need to receive. Planning to launch a new offer? How about dripping out a few intriguing emails to subscribers in anticipation of the offer? Marketing automation will not only make your life easier, but it will also save your sanity as you won’t have to use all your mental power just for remembering when you’re supposed to send which email to which subscriber segment and for which offer. You can just put it on autopilot and forget about it. Extra tip: The more campaigns you can automate, the better! So you’ve sent that email to the right segment and scheduled a few automatic follow-ups to catch people who might otherwise fall through the cracks. Hooray! Now it’s time to check how your email performed. Did people open it? When did they open it? And on what device? Did they click on your links? Which links? Did they take further action? Did they share with their friends? Adjusting things like the time you send emails and the way you present offers based on customer behavioral insights can have a huge impact on the success rate of your email campaigns. The more details you know about the performance of your emails, the better you’ll be able to understand your clients, and the better email campaigns you’ll be able to create in the future. Which Email Marketing Software Best Fits Your Needs? There’s a great array of email marketing software available today. Of course, we couldn’t possibly discuss them all here, or this would become the never-ending post. Instead, we’ve chosen three email marketing software that can help growing business take their email marketing game to the next level and give them the growth boost they’re looking for. These are: Campaign Monitor, SendGrind, and Emma. In the sections below, we’ll take a closer look at each one, discussing how it performs in each of the three areas we’ve highlighted above. Campaign Monitor‘s vast collection of fully editable email template designs allows you to quickly and easily create appealing email marketing campaigns that will capture the attention of even your toughest clients. A full array and advanced analytics and detailed report capabilities let you optimize your campaigns by tracking and measuring the performance of every single email you send. Campaign Monitor has a friendly user interface with an easy-to-use drag-and-drop editor that offers the greatest design flexibility we’ve seen without having to resort to coding options. Starting with stunning templates, you can edit, personalize, and brand each email just the way you want. The platform’s segmentation options allow you to group customers according to your campaign needs. Basic features of marketing automation available even at the lowest-tier plan for all your campaigns, so you can set all your marketing needs on autopilot and use your energy and focus on your actual client work. Tools like A/B testing for titles and content, email previews in over 20 inboxes, spam testing, and time-zone sending, in the Unlimited and Premier plans, ensure that your emails reach subscribers the way you intend at the time you want. Real-time data and in-depth analytics reports will help you understand what best works for your clients and optimize your emails accordingly. Campaign Monitor‘s smooth platform will make it easy for you to create great-looking campaigns in minutes, while it’s robust automation and segmentation tool will enable you to target users based on messaging and actions. Additionally, Campaign Monitors analytics and reports will help you track the success of your campaigns and understand how your audience is responding to your emails. Another reason Campaign Monitor serves growing businesses well is its pricing plans. For just $9 a month you can send 2,500 email to 500 people (with access to all core email marketing features and basic marketing automation), which is just right if you’re maintaining a small list of one-to-one clients. If you need advanced capabilities, you can get access to features like advanced marketing automation, spam testing, and unlimited inbox preview for just $29/month. Even for a list of 2,500 subscribers, Campaign Monitor’s Unlimited Package comes in at just $59/month, much lower than even the starting offers of other email marketing services. Another great thing about Campaign Monitor’s plans is that you can adjust your subscription level and payment as your subscriber list grows, and your business needs change. SendGrid is a cloud-based email platform that’s been built with developers at large companies in mind. The focal points of the team behind this powerful software are deliverability, scalability, and reliability for marketers who send hundreds of thousands of emails at once. The service boasts particularly strong spam filters and protection. While all that may sound good and well, SendGrid falls short when it comes to the email needs of growing business. SendGrid offers a small library of email template designs that may not cover all your needs or give you enough options for your various campaigns. A drag-and-drop interface allows you to customize templates, but its capabilities are fairly limited. Working primarily with rigid “blocks” of elements, SendGrid’s designs tend to be less fluid that those of other services and end up looking a little clunky. SendGrid allows you to segment users into different groups and choose who receives a particular campaign. The service, however, offers no automated workflows for ongoing campaigns. That means subdividing customers or automating different campaign paths for customers who take different action in an email can become tricky if you don’t have a coder at hand. Basic analytics and reports, such as open tracking and bounce rate come standard in the program’s dashboard, but more advanced views aren’t available. Verdict: SendGrid is a powerful email platform that serves some of the biggest and most popular companies today, but the software’s basic structure and bare out-of-the-box capabilities don’t tend to serve growing businesses well. Unless you’re sending hundreds of thousands of emails each day, where stability and spam reporting play an essential role, you aren’t likely to have much use for SendGrid’s greatest capabilities. SendGrid plans start at $9.95/month for 40,000 monthly emails to a list of up to 2,000 subscribers with access to only the essentials options and at $79.00/month for access to the Pro version. If your goal is to find an email marketing software that allows you to create beautiful emails you can track and measure in an easy, intuitive dashboard without the assistance of coders, this options is unlikely to fit your criteria. Emma is a flexible email marketing software with a user-friendly interface that’s easy to navigate and understand. The software comes with a large array of email templates that allows anyone, from beginning users to designers at large enterprises, to create appealing email campaigns without dabbling into code. While user-friendly and intuitive, however, the interface of Emma can get quite “heavy” and slow-going when trying to edit the contents of the campaigns you’re creating. Users have reported issues with text spacing as well as with the software’s editing speed and auto-save capabilities (that seem to fail at times). Another point you’ll want to consider is that Emma doesn’t score as high in list management capabilities as other email marketing services do. Lacking the options to create subfolders or to pause (seasonal) subscribers, the service can prove quite inconvenient if your business has seasonal clients or works with groups of subscribers that may exist in more that one of your lists (or sublists). Emma comes with an array of powerful tools that will help you optimize your campaigns for your target audiences (such as A/B testing, dynamic content, and list segmentation). Some of the features, however, such as creating more than one automated workflows, accessing a preview of your campaign in different mailboxes, and adding private branding to your campaigns are only available with Emma’s higher-tier accounts. Verdict: Emma is a flexible email marketing tool with many beautiful templates to choose from and an intuitive UI that will make it easy for you to start building email campaigns. Keep in mind, however, that for all its design capabilities, Emma can get heavy during editing and slow your work pace down considerably. If you’re looking for a service that will give you greater insights into your customer data and let you divide your subscribers and automate your workflows, Emma may either not have all the capabilities you’re looking for or it may only offer them at the higher-priced tiers. Emma’s monthly subscription plans start at $89 for 10,000 subscribers, which is fairly pricey for what’s included in the package. For 25,000 subscribers the price jumps at $369/month, which needs some consideration if you’re aiming to hit that kind of growth in the future. Keep in mind, you can’t sign up for Emma right from the web but need to schedule a demo with one of their representatives. For all the reasons outlined above, we consider Campaign Monitor to be the best Email Marketing option for business owners and freelancers who’re looking to take their email marketing strategy to the next level. If you’re looking to grow your subscriber base, get better insights on your customer data, and build better email marketing campaigns that perform at high success rates, Campaign Monitor can help you reach your goals at a price that fits your budget. What email marketing software do you use? What features and capabilities are most valuable to your business on your email marketing platform?